In New York on August 14, 1781, late in the war for American Independence, allied generals George Washington and the Comte de Rochambeau received good news. A French fleet under Admiral de Grasse carrying 3,000 French soldiers was headed for the Chesapeake Bay. 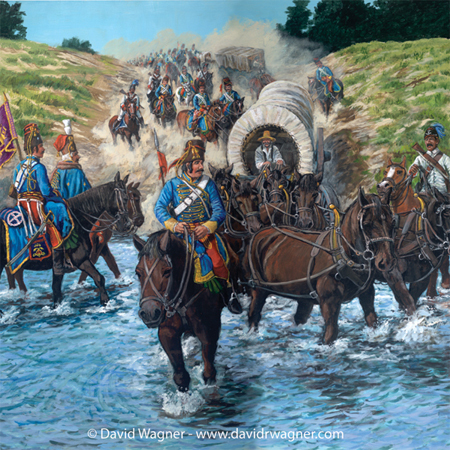 The generals decided to lead their armies southward 450 miles at all possible speed. They would create a combined grand army of 16,000 troops to surprise and lay siege to General Cornwallis' British army at Yorktown, Virginia. The armies began their route south at White Plains, New York. Washington then learned that Admiral de Grasse had successfully landed his troops at Jamestown, Virginia, under the Command of General Saint-Simon. Admiral de Grasse then successfully intercepted and defeated an English fleet headed for the Chesapeake, eliminating the possibility of Cornwallis escaping by water. The majority of the allied armies could then sail down the Chesapeake Bay to Yorktown. 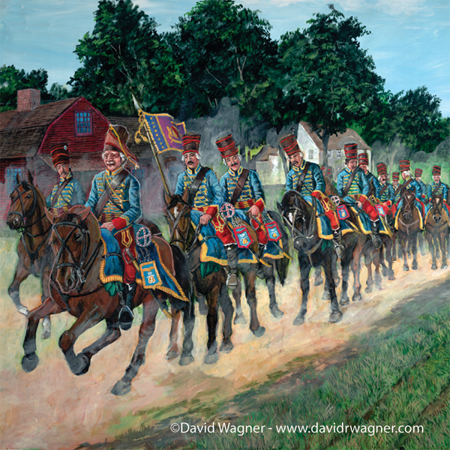 Their immense baggage train and field artillery continued on the overland route to Yorktown. The map below above existed in 1781 at the time of the Yorktown Campaign by the armies of General George Washington and the Comte de Rochambeau. The diagram on the map represents the passage (blue) of the troop ships down the Chesapeake Bay and the route (red) of the overland baggage train. 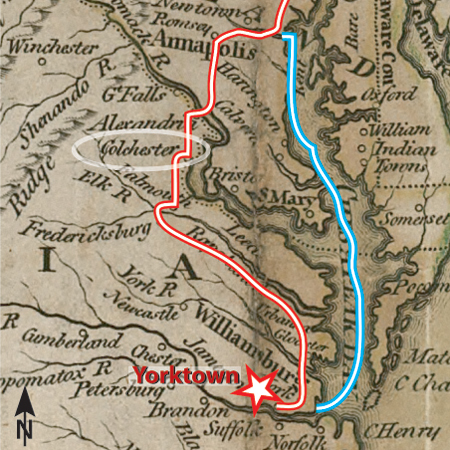 These routes converged for the victorious siege of the British army at Yorktown, which proved to be the most decisive engagement of the American Revolutionary War. Among the prominent users of the Colchester ferry and the nearby river ford in 1781 and 1782 were generals Washington and Rochambeau. The generals crossed on the ferry on September 16, 1781, following a brief visit at Mount Vernon on their way to lead the battle at Yorktown. It was the first time General Washington had been home to Mount Vernon in six years. 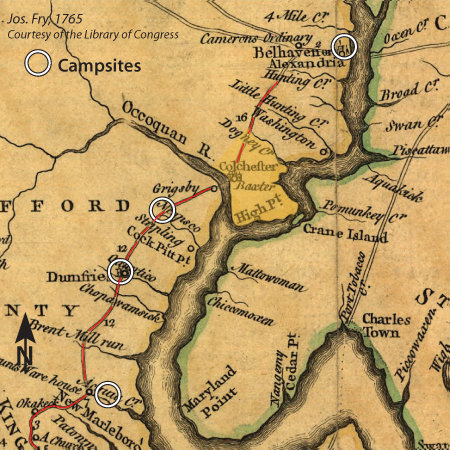 The allied overland baggage train passed through Colchester on September 27, 1781 after camping at Pohick Creek and Giles Run near Colchester. 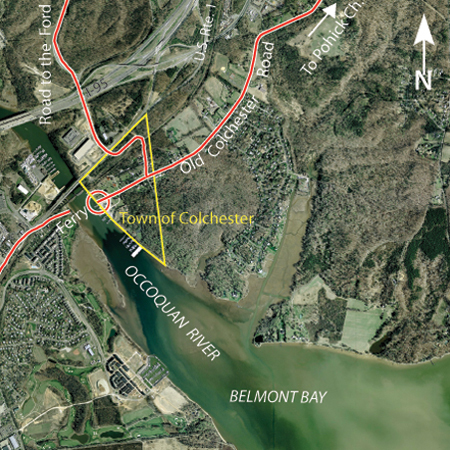 The route followed the Post Road or Kings Highway, today Old Colchester Road, but then equivalent to Interstate-95. The American army again passed northward through Colchester while enjoying much local jubilation in 1781, about a week after the British surrender at Yorktown. The French army also returned northward through Colchester in July of 1782 after wintering in Virginia. 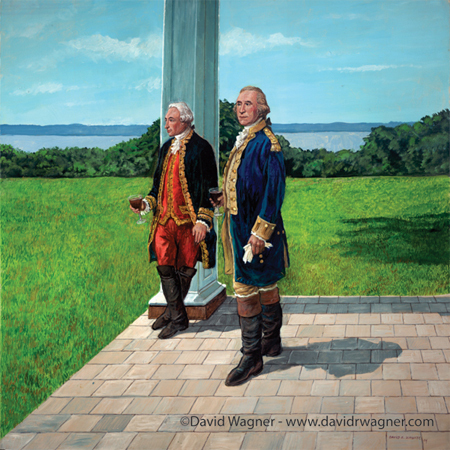 Generals Washington and Rochambeau in a relaxing moment at Mount Vernon.